The Warren Buffett indicator, which he used in the late 1990's to gauge the market's overvaluation, has surged past the 2007 peak and is now rapidly approaching the 2000 mania high. It is the value of the U.S. stock market divided by U.S. GDP (or how big the market has become in relation to the real economy). Crestmont provided an update of their P/E ratio this week showing that the U.S. market is now more overpriced than the 1929 and 2007 tops. Will the market mean revert back to its historical regression line as it always has in the past, or does gravity no longer apply? One the main arguments for the bulls is that there will continue to be new money entering the market from the sideline. 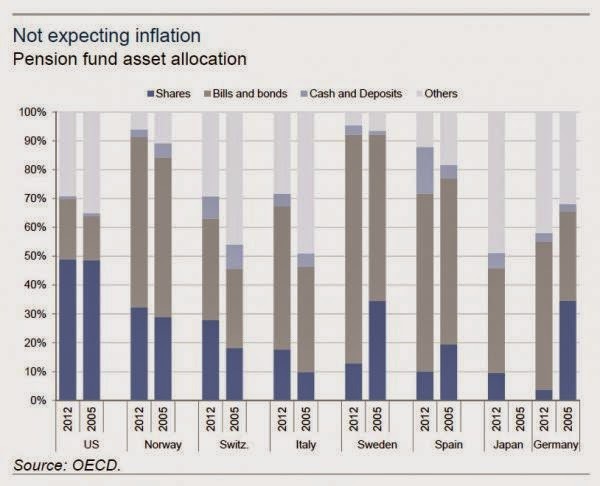 The chart below shows that this sideline money is unlikely to come from pension funds in the United States which already have 50% their portfolios in equities! (dark blue lines) If these funds begin to get nervous and believe stock prices could face another serious decline, it could be a tidal wave of selling as they scramble back into safer asset classes (remember that pension funds are already seriously underfunded which is why they are reaching for risk in the first place). What about time? Surely we must still be early stages of a cyclical bull market, right? Unfortunately, no. The chart below shows that the current bull market in stocks, which is 283 weeks old (5 years and 5 months) is the second longest in 85 years! 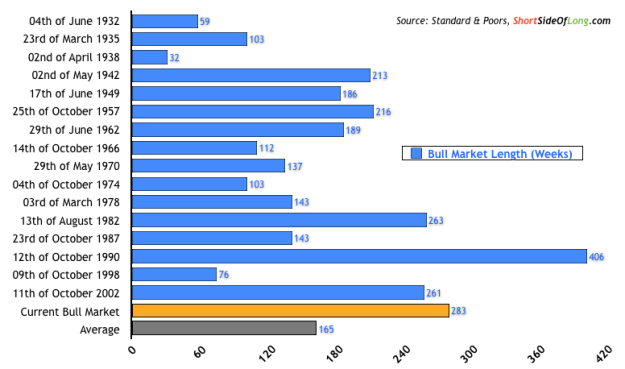 The average bull market lasts 165 weeks (3 years and 2 months). The only stretch that lasted longer was the incredible run during the 1990's. During the 90's in the U.S. there was strong growth, commodity prices were falling, and interest rates were falling. We may be about to embark on a period when all three of those tailwinds become simultaneous headwinds. 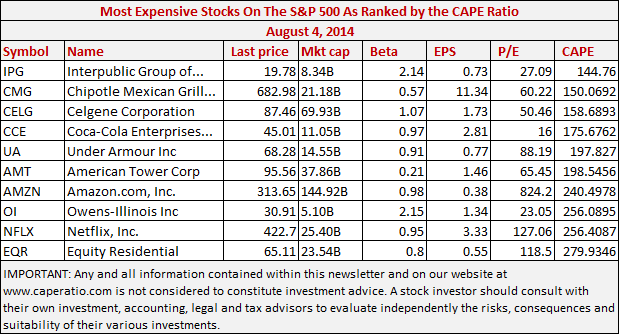 One last bonus chart below, which shows the 10 most expensive stocks in the S&P 500 based on their CAPE P/E ratio. This may be a list to tuck away for the future if we are at or close to the cyclical peak in stocks because you may not see price to earning ratios approaching 300 for many years to come (a healthy P/E ratio is in the 8 to 12 range). The U.S. Stock Market Is Now More Expensive Than The Bubble Peak In 2000.